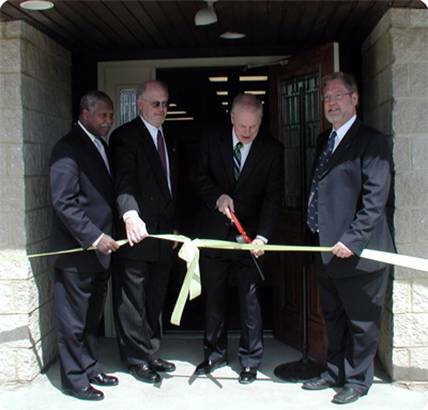 Mansfield, OH, April 7, 2008: Energy Technologies, Inc.(ETI) opened its newest 5000 square foot facility today after a ceremonial yellow ribbon was cut by Ohio's Governor Ted Strickland. Following the ceremony, the governor and various other city and county officials were given a tour of the new offices along with ETI's manufacturing facilities. The building, located in downtown Mansfield, was in a state of total disrepair until purchased by ETI in 2006. ETI then began a total renovation as part of the company's continuing expansion. The building is now an attractive addition to the community receiving praises from all the local businesses and residents. The renovation features many energy efficiency upgrades which will ultimately include powering the building by Solar Energy. This beautiful state-of-the-art facility will now become the new home of Energy Technologies' Research and Development along with Engineering, Sales and Marketing. In addition to ETI's existing power product offerings, the company is now developing many renewable energy initiatives including solar applications and fuel cells. Energy Technologies was recently awarded a one million dollar development grant through Ohio's "Third Frontier Fuel Cell Initiative" on fuel cell technology. Energy Technologies, Inc. (ETI), established in 1992, is a privately held electronics and technology manufacturing company. ETI currently operates from its 32,200 square feet of manufacturing and engineering facilities in Mansfield, Ohio. ETI has become a world leader in providing extremely reliable power backup and generation equipment to the Defense, Homeland Security, Industrial, Medical, and Telecomm market sectors .